On Mother’s Day, after three hours of sleep, I arrived at Hayward Field at 6:55 a.m. to watch the Eugene Marathon start. While I might have done this just for fun, I was there for one specific reason: to watch my mom start her second marathon. Among the thousands, I did not spot her, but I did tear up when all those strangers glided past me. Maybe I’m too emotionally invested in the running community, but whenever I see people run road races, I think about the transformative power of running and it gets to me. Something about the determination and bravery that it takes to step on that line is as moving to me as any art piece. Three hours and three cups of coffee later, I drove to the Owosso Bridge, located 20 miles into the marathon. There, my real job began; I was to meet my mom and run with her through mile 25, just like I had three years prior in her first marathon. Over the previous months, she had talked nonstop about the marathon, so I knew the plan. She wanted to qualify for the Boston Marathon, which would require a 4:10 final time–she ran her first one in 4:09.26–and a 9:30 minute/mile pace. Thanks to technology and her bib number, I also knew that she had passed the half-marathon mark in a 9:40 pace. I stood shivering with a handful of other dedicated cheerers; the runners ticked by with the minutes. I watched a woman emerge from the path and plant an eager kiss on her boyfriend. I watched another woman burst into tears when her boyfriend excitedly said, “You’re averaging 10-minute miles!” He did not receive a kiss. By this point, Boston was beyond reach and I prepared to comfort my crying mother. But when I finally spotted her purple shirt 20 minutes after I expected it, she looked emotionally stable. “It’s not my day!” she said with surprising conviction. No tears, no curse words, just a 5’5” build trucking along. Over the next five or so miles, we averaged two minutes slower per mile than she had trained for or anticipated. At times, I worried that she might fall off the bike path when she ran too close to the edge. I did my best to say inspirational things like, “Nick Symmonds has never run a marathon. You’ve done two! That means you’re way better than him.” Mostly, though, I worried that after the race, she would be devastated. Maybe I expected this because that’s how I would feel. Just a week prior, I had run my worst race of the season to cap off perhaps the worst week of my year. In the span of a few short days, all the things I had worked toward for months fell apart, and since I was entirely unprepared to deal with it like a person with actual perspective, I counted them as failures of my humanity. 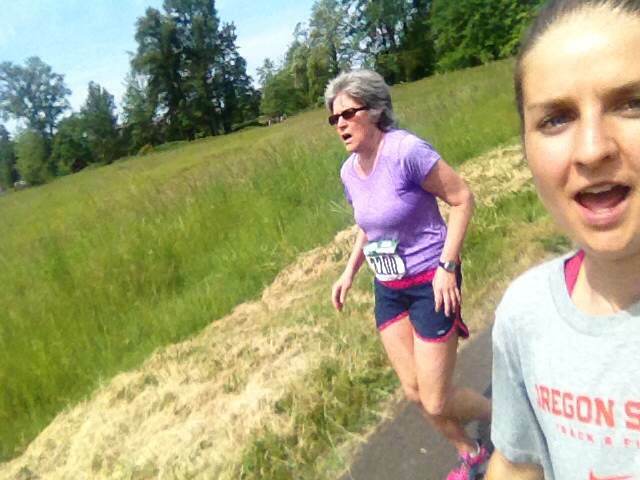 So, while I jogged alongside and took selfies with my semi-delirious mother, I thought about all the things I could say to console her afterward. How I would remind her that running success is not evidence of human success and that it’s really the process that matters, all the training and the lessons along the way, not just the race. With half a mile to go, I said, “It’s all you now. You know what to do” and sprinted to Hayward Field with enough time to pee before she finished. She crossed the line in four hours and 34 minutes; 24 minutes too slow for Boston. When we all went to greet her, to my complete surprise, she was totally content, maybe even happy. Here’s a really high quality selfie that shows how much fun mile 25 can be. When I think about her response to a perceived failure versus my own, I think the difference is gratitude. She understood all the nuances about racing before I told her because she could already appreciate and recognize the gift of this marathon. With even the tiniest bit of gratitude, a world can change. In my own world, after bad news continued to pile on in heaps, I stopped for a moment and listed all the things that made me grateful to be alive: watermelon, oatmeal, 30 degree mornings, college, my family’s support, Inca (my dog), Chance the Rapper, airplanes, etc. I felt broken, but my spirit was intact. The bad news continued to come, but rather than be moments of failure, they became moments of opportunity. I can still be hopelessly idealistic and chase after big, impossible things. I will still feel defeated and heartbroken when these things don’t happen, but I will also be okay. I am not entitled to a spectacular season or infallible plans, but I am entitled to do everything possible to make these things happen. My mom was not disappointed with her marathon because she had no regrets; it was not her day. She did the absolute best she could, and that was enough. When I made my gratitude list, the most important thing, the thing that will always be at the top of my list, is this moment right now, this breath and this heartbeat, the tiny details that allow me to make a list, and to make another breath and another heartbeat into a moment with possibilities so endless I cannot imagine what might happen next. For that, I am forever grateful. This entry was tagged existence, gratitude, marathon, mothers, running. Bookmark the permalink.